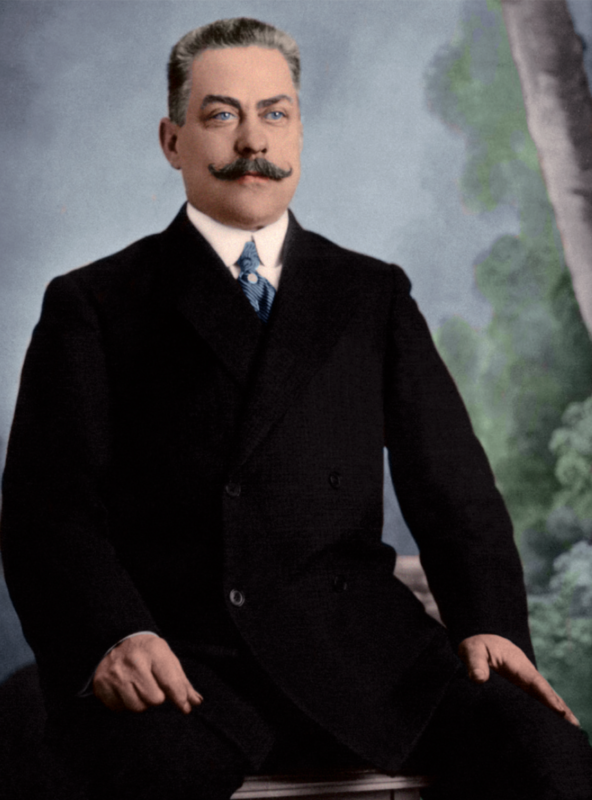 Manuel Ramirez de Galarreta and Planell was born in 1864 in Alhama de Aragón. Although the usual residence of the family was in Madrid, the father’s work took them to stay in Alhama de Aragón on occasion. Manuel was his older brother’s (José Ramírez I) apprentice and learnt everything involved in the guitar trade from him. Back in 1891, at the age of 27 he decided to become independent. Initially his idea was to set himself up in Paris, and on communicating this to José, José helped him with his plans to bring the project to fruition. But no-one knows why Manuel changed his mind and ended up in no. 24 Calle Cava Baja in Madrid. This action caused enmity between the brothers, which was never resolved. After having been in Calle Cava Baja for a while, he moved the workshop to no. 5 Plaza Santa Ana and much later to 10 Calle Arlabán where he settled permanently. In a short time, he managed to be regarded very highly not only as a manufacturer of guitars but also of violins and other stringed instruments. He was nominated as Luthier of the Royal Conservatory of Madrid. Additionally, he continued the school founded by his brother. The guitar-makers he trained, on becoming independent were recognised as the best manufacturers of the era. These students included Santos Hernández, Domingo Esteso and Modesto Borreguerro. 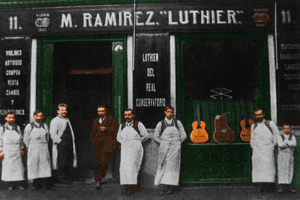 Due to the success of the ‘Tablao’ Guitar designed by his brother José, Manuel continued to make them, but little by little he developed his own template until he got a flamenco instrument which continues being the model for this type of guitar and which his disciples continued using. One day in 1912 something happened which gave rise to one of our most famous anecdotes. A guitarist with an extragavant air came in to his workshop on Calle Arlabán with the intention of hiring a classical guitar. Manuel found this proposal amusing and he decided to go with the flow out of curiosity. Manuel gave him a guitar so that he could try it out. In the meantime he returned to José del Hierro, professor of the violin at the Royal Conservatory of Madrid, to continue his earlier conversation. Both of them were engrossed and astonished with the way the youngster was playing the guitar, such that the professor tried to persuade the youngster to give up the guitar and told him that he should dedicate himself to the violin otherwise he would never achieve any success. Manuel, who had been listening to the conversation, decided to gift the guitar to the youngster on the proviso that he played it everywhere, knowing full well that in his hands this instrument was going to flourish in a marvelous way. This is the guitar which is on show in the Metropolitan museum of New York which together with the Manuel’s label also bears a label of Santos Hernández who later repaired it. The extravagant youngster was none other than Andrés Segovia.